The British imperial enterprise from the 18th century to the 20th, and particularly the frenzied rush to control African territories in the late 19th, afforded opportunities for employment and profit to many Irishmen. During that long span of imperial ambition, the British Army drew large numbers of recruits, as well as separately standing regiments, from countries other than England, Scotland and Ireland chief among them. In Joyce's Dublin, stories circulate of men who have joined the British armed forces, and also of unscrupulous individuals who have made obscene profits off the war machine. In Eumaeus, Bloom thinks "Irish soldiers had as often fought for England as against her, more so in fact." At times in the 19th century, it was also true that more Irish troops were in uniform than English ones. The great famine of the late 1840s, and growing nationalism, reduced Irish enlistment from over 40 percent of the force earlier in the century to less than 10 percent by World War I, but the total numbers were still large. 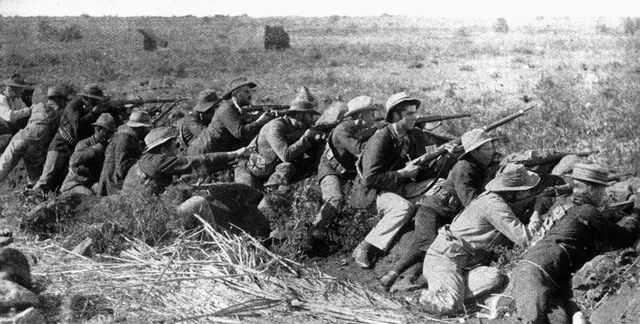 Nearly 30,000 Irishmen fought in the Second Boer War, just before the time represented in Ulysses. At the end of Telemachus Mulligan learns that his friend Seymour has "Chucked medicine and [is] going in for the army." The swimmer who gives him this information about Seymour mentions that he saw a well-off girl named Lily "Spooning with him last night on the pier" (OED: "To make love, esp. in a sentimental or silly fashion"), and Mulligan asks, "Is she up the pole?" (OED: "pregnant but unmarried"). A pregnant girlfriend would explain Seymour’s sudden decision to abandon his study of medicine and secure one of the few near-certain sources of gainful employment available to young men in 1904 Dublin. In Nestor, Stephen thinks of one of his students' family as "Welloff people, proud that their eldest son was in the navy." In Lotus Eaters Bloom contemplates recruiting posters on the wall of the post office, and in Lestrygonians he thinks of young revolutionaries who quickly change their tune: "Few years' time half of them magistrates and civil servants. War comes on: into the army helterskelter." In Eumaeus, the old sailor calls Irish troops and sailors "the backbone of our empire," while the innkeeper retorts that "he cared nothing for any empire, ours or his, and considered no Irishman worthy of his salt that served it." Both of the Blooms have lost companions in the Boer War. Ithaca mentions a school friend of Bloom's named Percy Apjohn who was "killed in action, Modder River," an engagement fought in the Cape Colony in November 1899. In Penelope Molly thinks of a young lieutenant that she flirted with in a very serious way at about the same time: "that Pretoria and Ladysmith and Bloemfontein where Gardner lieut Stanley G 8th Bn 2nd East Lancs Rgt of enteric fever he was a lovely fellow in khaki and just the right height over me." The chapter later makes clear that Gardner has died of the fever. In wars fought before the age of antibiotics, it was very common for more men to die of infectious diseases than injuries. Craftier souls found ways of thriving without risking their necks. Mulligan says of Haines that "His old fellow made his tin by selling jalap to Zulus or some bloody swindle or other”—jalap being a violent purgative obtained from the dried tuberous root of a Mexican vine of the morning-glory family. It should be noted that this story is probably pure invention. Trench’s father apparently enjoyed a distinguished career in the army and was a scholar rather than a huckster; he published several military studies. 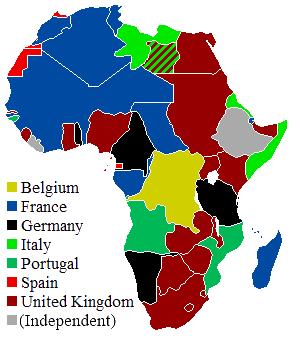 Areas of the African continent controlled by European colonial powers in 1914. Source: Wikimedia Commons. Taking of Kumasi in the Second Anglo-Ashanti War, 1874. Source: Illustrated London News. 1899 photograph of Boer citizen-soldiers in a trench at Mafeking, held in the Imperial War Museum, London. Source: Wikimedia Commons.